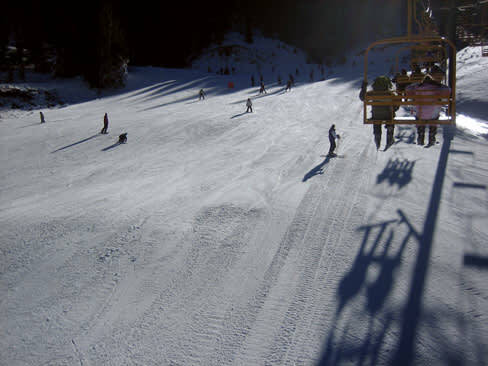 The first time I ever skied at Red River, 10 years ago, it was one of those flakeless winters that New Mexicans must occasionally endure as the price, I suppose, for living in what’s normally a ski paradise. I drove up to the mountain from my home in Santa Fe and found, to my great relief, a broad boulevard of white snaking down the front of the hill. There hadn’t been a puff of snow anywhere in the state, but Red River, which prides itself on its extensive snowmaking—the mountain hasn’t missed a Thanksgiving opening day in 20 years—had several runs fully covered. For a ski junkie like me who suffers physical symptoms of withdrawal in low-snow seasons, this was good medicine. I’d longed to get back there ever since. Typically, ski outings rarely take me farther north than Taos, but last March, after some hefty snowfall, I returned at last and found that little had changed. Red River, the town, is a tiny, high-desert hamlet. Population: less than a busy day at Walmart. Nestled in the Sangre de Cristo Mountains about 50 miles from New Mexico’s northern border, along a river named for the area’s copper- and gold-mining heritage, it boomed to nearly 3,000 people—prospectors, miners, traders—in the late 1800s, before finally dwindling to around 500 full-timers in the second half of the 20th century. In its post-mining era, Red River has reinvented itself as a family-focused, high-mountain playground that is particularly popular with folks from points east, mostly Texans fleeing the heat in the summer and seeking slopeside action in the winter. In fact, there’s a distinct Texas pride about the place. I couldn’t resist buying a poster that read “ski the republic of texas” and featured an 1836 map of the Texas Territory, which expanded north and west to include places like Steamboat Springs, Aspen, and, yes, Red River. The town, entirely surrounded by the Carson National Forest, is a standard stop on the Enchanted Circle Tour, one of the most scenic drives (and bike rides) in the state. Its quaint Main Street is a mix of rustic Western mercantiles interspersed with a few Bavarian-themed chalets. In the winter, the crown jewel is the ski area: 57 runs rise 1,600 vertical feet right from the sidewalk. At the base area, I met up with Wally Dobbs, 66, the mountain’s cheery, silver-haired snowsports director. Dobbs has been skiing at Red River for nearly 40 years. When he retired from his job as a salesman based in Texas, he and his wife moved to Red River for the quality of life. He took up working again, as a ski instructor. Dobbs is typical of the kind of person you’ll run into at Red River, which is to say that a) he’s a really nice fellow, and b) he’s a Texas transplant with a deep love for northern New Mexico who is making a lasting impact on the region’s quality of life. He was recently inducted into the New Mexico Ski Hall of Fame for, among other things, helping turn Red River’s teaching program into one of the best in the country. From the Ski Tip Summit House we took in dazzling 360-degree views, including ridges along the Latir Peak and Wheeler Peak Wilderness Areas. After a couple of warm-up runs, I mentioned to Dobbs that the mountain seemed quiet for such a beautiful Saturday in March. I could see why lessons are so popular here. Not only is the ski and snowboard school staffed by a small army of personable folk like Dobbs, but the mountain is impressively user-friendly. The terrain features mostly wide, rolling beginner and intermediate runs. Off the backside of the hill is the Morningstar Miner’s Camp, a never-ever’s easy green-run dream park, themed like an old mining camp. At the time of my visit, the attractions were half snowed under and the lift operators had to dig out the chair loading zones. I tried to keep up with Dobbs down some smooth groomers—he ripped!—before he left to teach a lesson. In the afternoon I set off on some solo exploration. Red River isn’t Taos, but it does have enough steep blues and blacks to keep aspiring experts happy. I particularly liked a challenging trio of frontside runs: Dropout, Mineshaft, and Cat Skinner, precipitous lines with forgiving snow and majestic views. But overall, Red River is a cruising mountain—fun, fast, and wide open. After a full day of downhilling, I met my girlfriend, Claire (who’d driven up from Santa Fe after work), at Bull o’ the Woods Saloon for an aprés drink. By day, Red River is a family-friendly outdoor playground. But at night—hang on to your Stetson—this place likes to party. Time it right and you might catch the Highway 38 Houndogs rocking out at the Bull. Or, better yet, show up around mid-February for Mardi Gras in the Mountains, a raucous alpine version of Fat Tuesday complete with parades, costumes, and bead-tossing. Or show up almost any time at Texas Reds, on Main, which rocks out with live music every Thursday and Friday night. It was considerably quieter while we were at the Bull. A handful of locals nursed pints around the barroom’s well-worn wooden tables, while a couple of dogs roamed the floor. We gobbled down some happy-hour shrimp cocktail, then walked over to Timbers, a popular steakhouse, for dinner. Timbers has a lodge-like atmosphere, and it’s about the closest thing to fine dining as you’ll find in town. Not much in Red River qualifies as hifalutin. I had an enormous Angus-beef hamburger slathered in green chile, and Claire had the chicken tempura. Both were great. Lodging in town is, like the food, comfort-based. We took a room (enormous!) at the Golden Eagle Lodge, a pet-friendly, pine-paneled motel just east of downtown. The room provided everything we needed, with one particularly impressive amenity: a package of fresh ground coffee, hand-roasted by the proprietors, Jerry and Marla Vowell. This detail summed up hospitality in Red River: home-style accommodations with a refreshing lack of pretense, and hosts who make sure you’re comfortable and well fed. For breakfast, we made our way to Mountain Treasures, a bakery, bistro, and gallery, and enjoyed the Breakfast Mike, a ham-and-cheese-omelet sandwich on a sweet, Czech-inspired kolache roll. We also picked up a couple of Trash Cookies for an afternoon snack. This is one of the most insanely decadent treats I’ve ever had: a giant cookie with m&m’s, pieces of Twix bar, white-chocolate chips, and “whatever else” was around at the time of baking. Late that morning, Claire, our dog, Minnie, and I made our way up Bobcat Pass to the Enchanted Forest Cross-Country Ski Area (EFXC). We both love to downhill ski, but for those who are less (ahem) inclined, EFXC is a great alternative. This was my first visit to the Enchanted Forest, though I’d heard much about its reputation as a professionally maintained track. There are 32 kilometers (about 20 miles) of groomed trails that accommodate both traditional kick-and-glide and freestyle (or skate) skiing. (Lessons are available in both techniques.) Another 15K of trail are dedicated to snowshoers. And, perhaps best of all, a separate, groomed 5K network is open to dogs. Many skiers who like to recreate with their animals follow the same program we did: warm up on the short network with your dog before striking out on the main trail system. The Enchanted Forest was opened in 1985 by John and Judy Miller, who maintained the trails and ran the snack and rental shop out of the Welcome Hut. Last year, their daughter, Emily, and her husband, Geoff Goins, bought the business and have been hustling to make improvements. Most notable is the addition of a 20-foot trailside yurt available for overnight rental. You have to ski or snowshoe to it from the parking lot, and Claire and I peeked through the window during our afternoon loop. It’s kitted out with a propane stove, some kitchen utensils, and a few board games. The yurt sleeps five, in bunks. That evening back in Red River, we refortified ourselves at the Black Mountain Lodge and Playhouse, which was also under new ownership and undergoing some updates. By “Playhouse” they don’t mean dinner theater, they mean having fun—ideally, with your kids. Black Mountain has an arcade, a roller rink, and a full-service restaurant. The bar, just steps from the ski lifts, is of the throw-your-peanut-shells-on-the-floor variety. The pizza was large and piping hot, and the beer frosty. What more could you ask? I fantasized out loud about hitting the mountain on a powder day. We clinked our mugs and vowed to return—soon.